We are filming a new MonkiSee video called Animals Under the Sea. We would love to feature your child in the video. Watch the clip below to find out how you can have your child participate in the video. You can send us your video through DropBox (if you don’t have an account let us know and we will send you an invitation) or you can mail it to us on a flash drive. If you have any questions just send us an email! We can’t wait to see your video! This entry was posted in Uncategorized on April 4, 2014 by Krista G..
A book that can summarize my feelings about books so exactly is worth mentioning. I came across this book a few weeks ago and realized that this should be the epitaph inscribed on my tombstone when I die. Oh, how blissful it would be, to spend eternity reading. 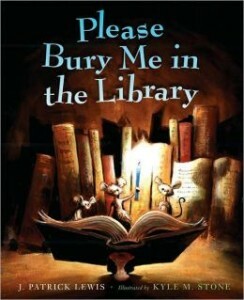 Please Bury Me in the Library is a really cute book of poems for kids. I really like the poem and thought I would share it here. With Bookworms in my coffin. If you like poetry books for kids, this is a short, sweet addition to add to your read alouds. My kids and I really enjoyed it. The poem What If Books Had Different Names inspired me to write a few new parodies myself. This entry was posted in Reviews, Uncategorized and tagged book review on January 29, 2014 by Krista G.. Here we are at the beginning of a brand new year. This is a great time to assess where we are in our lives and where we want to be. In 2012 I joined some other moms in trying to read 1,500 books to my kids that year. We did it and it was a very interesting experience. Then last year, some one suggested that we read 2,013 books to our kids during the year. I eagerly signed on and was ready to go for it. That would require me to read 6 books a day to my daughter, which didn’t seem at all impossible. Well, the air quickly went out of my sails, and I realized that we have entered a new phase in our reading which consists more of chapter books. While I was hopeful that I could read six picture books a day plus chapter books, I quickly realized I couldn’t. So, I did something I really don’t like to do. I quit the read aloud challenge. Coincidentally I just read Jim Trelease’s The Read-Aloud Handbook: Seventh Edition this past December. He mentioned a family that set a goal to see how many days the father and daughter could read together without taking a break. They kept a running total that was well over three thousand days. This included proms, a divorce and their read aloud days ended when she left for college. I found that story to be so inspiring. I realized that while I did read my kids a lot of books, we still had days that no reading aloud for pleasure was being done. More than having a list of all the books we read, I craved reading to be a daily habit. So three days before the New Year I began our daily reading adventure to establish reading together as a daily habit in my home. I am so pleased with the results. Worst case scenario, I read one chapter of our book. Best case, I usually read for about an hour. Won’t you join me in establishing reading as a daily habit in your home regardless of the age of your children? My children range from six years old through eighteen years old, but none of them have grown tired of sharing a read aloud with their mama. If you want to get motivated to read to your kids look no farther than The Read Aloud Handbook. It is a fabulous book and includes lists of great books to read to your kids. This entry was posted in Uncategorized on January 15, 2014 by Krista G.. I did a review some time back for the Seeds Family Worship sampler CD. We loved it then and we still love it now. If you or your child want to learn to memorize scripture set to upbeat music, this is the easiest way to do it. They have some very modern sounding music with a great message, which makes learning Bible verses a snap. You can download their Seeds of Praise album completely free from now until Thanksgiving. This is a very generous offer, so tell everyone you know. To claim your free album visit the Seeds Family Worship page and click on Buy Now. When it says name your price, enter a zero and the album will download for you immediately. It couldn’t be easier than that! This entry was posted in Uncategorized on November 18, 2013 by Krista G.. There is a lot of anxiety over the developmental phases of our children. When they are not talking much, we start to wonder what is causing this delay. This is an unpleasant experience for both parent and child, but thankfully there are many ways you can stimulate and increase your baby’s vocabulary. The most important step to take in building your baby’s vocabulary is to talk to the child incessantly. The child needs to have a lot of input of spoken language in order to develop an understanding of language and generate an output. You can do this by talking to your baby about everything that is going on around you. Encourage your baby to talk by asking your child questions and waiting for an answer. If your child is slow to answer, wait a moment and then provide a suitable answer. Reading to babies and young children is monumental in building their vocabulary. When we read to our children we engage them in a relaxing and entertaining brain building exercise. This is crucial to proper language development and helps the child feel in command of their language. Children that are read to regularly are adventurous in the words they use. They are not afraid or shy to express themselves with new words. In fact, they think it is a lot of fun. When a child uses a new or unexpected word, it oftentimes generates a positive response from their parents, which makes them eager to be even more adventurous in the words they use. Educational videos can also be a tremendous aid to parents. The MonkiSee line of DVDs are designed to build and develop language skills in babies and young children. MonkiSee captivates young children with the use of lovable puppets, silly skits, lots of great music, real life videos, and of course, a vast amount of relevant narration. Each volume of the MonkiSee DVDs is full of written and spoken language. Including tons of original poetry that is presented in a gentle and engaging manner, draws the young child in to what is happening on the screen. Due to the way these videos are designed, children often experience a language explosion – sometimes doubling their vocabulary. While reading to your child is the best activity you can do to encourage and stimulate your child to talk, the MonkiSee DVDs are a very close second. Each volume includes lots of rich and relevant vocabulary which is usually encountered only during reading time, and most importantly, the child is having fun all the while. If you would like in increase your baby’s vocabulary, the MonkiSee DVDs may be just what you are looking for. To find out more visit www.monkisee.com. Below is just one testimonial from a very happy customer whose daughter’s vocabulary has doubled in the month that she has been watching the MonkiSee DVDs. You can view her whole review at Growing Up Madison blog. Below you will see an excerpt of her review. This entry was posted in Uncategorized and tagged baby vocabulary, baby words on October 14, 2013 by Krista G.. I was planning to create a post announcing that Howie and Skip from MonkiSee now have their own channel on YouTube, but someone beat me to it. The other day I received the latest post from one of my favorite early learning blogs called PushPlayLearning. I have referred to Lacy as the YouTube Queen, since she really knows how to find great videos for her kids. It was with not too much surprise, actually I was surprised, that she was our first subscriber to the new YouTube channel. Since then she blogged about it on PushPalyLearning. Her post was so awesome that I will share it here. You can view it on her blog at Howie and Skip TV. Thanks, Lacy for taking the time to write such a nice review. It is one of the nicest reviews I have seen. What? Did you just read that right? Yes, the cute and loveable Howie & Skip from Monkisee now have their own channel on YouTube featuring the best of the best clips from the Monkisee DVD series. Finally, I get a peek into the wonderful world of Monkisee that so many people have been raving about. Filled with lots of clips that showcase the lovely rhymes and song that fill the Monkisee DVD series, Howie & Skip have a YouTube channel that is surely going to delight children from ages 0-6. Of course, it is filled with lots of opportunities to pick up great reading skills or it just wouldn’t make the list, but Monkisee goes beyond your typical baby reading show. It is truly engaging and mesmerizing. Just the right amount of time is spent between introducing words, singing and listening to language building rhymes. The storylines are wonderful and Monkisee does well fitting in lots of fun facts about animals and other things while also encouraging good habits and attitudes. The delightful host Olivia is a helpful friend that encourages Howie & Skip as they learn about shapes, animals, action words, ABC’s, colors and more. There is a wonderful love for learning that is woven through the show and you can really see it shine on Howie & Skip TV. I think that is one of the elements that I love most. These wonderful clips will make you want to run out and buy the full DVDs. I had thought that I had my fill of baby learning DVDs. It seems I have mountains of them, and with Micah reading so well, I just didn’t see a cause for buying anymore. But all my children have enjoyed these wonderful clips filled with songs, rhymes and fun facts, that I am definitely going to put them on the must have list for Christmas. Alright, get over there and subscribe to Howie & Skip TV. If you haven’t started your little one on their reading journey, I think this is a great YouTube channel to get your journey started. Warning: You might fall in love and need to pick up the entire series. *This post contains affiliate links. If I like what I see, I like to share it. This entry was posted in Uncategorized and tagged howie and skip tv on October 11, 2013 by Krista G.. I received this email the other day in response to announcing the new Howie and Skip’s StoryTime sereis. It is emails such as the one below that make all that we do worth it. To know that people appreciate and love our products makes it all worth while. Below you can read the email for yourself. My name is Stephanie and I just want to tell you how happy I have been with your products. My children have used the MonkiSee Baby Reading Program Starter kit since they were 3 months old. My 2 year old now knows over 200 sight words and can read from simple books. I attribute this to the amazing program you created! I am so excited that you are always coming up with new ideas such as Monki See Action words (one of our favorites) Monki See Animals at the Farm, Monkey See ABC Roundup, and now the StoryTime DVD. I hope you continue to expand your program and products so that my children can grow up with Monki See during their early childhood years. I would love to see a series on Money, Time, Feelings, Important Monuments (seven wonders of the world)… maybe Skip and Howie can travel to far away lands and help us learn about new cultures? I just didn’t want to pass up the opportunity to tell you thank you for making such an amazing product that has given my children the love of learning! This entry was posted in Uncategorized on October 10, 2013 by Krista G.. The brand new Howie and Skip’s StoryTime DVD – How God Made Everything will be released on October 18th, 2013. We are really excited about this project and know that you will love the song. You can pre-order a copy of the StoryTime DVD for just $9.95, but in the meantime, check out this wonderful song about all the days of creation. Just be warned that it is a very catchy song. This entry was posted in Uncategorized on October 7, 2013 by Krista G..
StoryTime for children? I am really excited to write this post today. In case you don’t know this about me – I’m a HUGE book lover. So now that I have come clean with that, it is okay to admit that I love to read picture books. I am always searching for great picture books that I have not read. I consider picture books to be great and comforting friends, and I know that my kids feel the same way. One day at the library my daughter picked up a favorite book (I cannot remember which book it was) and hugged it to herself with a look of pure contentment on her face. I feel the same way when I encounter my favorite books as well. Thinking ahead, I wonder what I will do when my kids are too old for picture books. Maybe they will never outgrow them just as I haven’t. I have been to a few storytimes at my library, and they are never done the way I would like them to be. Being such a big book lover I dream of being able to step in and take over. Well, I no longer need to dream about being asked to conduct storytime at the library. We just completed a brand new project called Howie and Skip’s StoryTime.DVDs If you know these monkeys from MonkiSee then they need no introduction. Well in the first volume of StoryTime, Howie and Skip hear the story How God Made Everything. The story is a rhyming retelling of the creation story from Genesis. I had so much fun writing this story and even more fun sharing it with my two favorite monkey friends. I got to work with my beautiful and talented daughters to write some really great sing along songs to accompany the story as well. All in all, this has been a really fun and rewarding project. I offer you some samples to view below. I don’t know about you, but I wish I could read to my kids for hours every day. I really believe in the benefits of reading to my children, but I don’t have the time to read as often as I would like. That is where Howie and Skip’s StoryTime comes in. With just the press of a button you and your child can enjoy storytime – anytime. There are lots of ideas in the works for a many more volumes including more Bible stories, picture book stories, and fables. Click the video below to see a sample of Howie and Skip’s StoryTime – How God Made Everything. You can pre-order a copy today for just $9.95. They will be shipped on or before October 18, 2013. For more information check out How God Made Everything. This entry was posted in Uncategorized and tagged children story time, storytime on October 4, 2013 by Krista G..